Duck breast is my wife’s favorite dinner. I can only agree, it’s got that light gamy flavor, and the duck fat is widely known to be bacon’s only challenger in the world of fats. 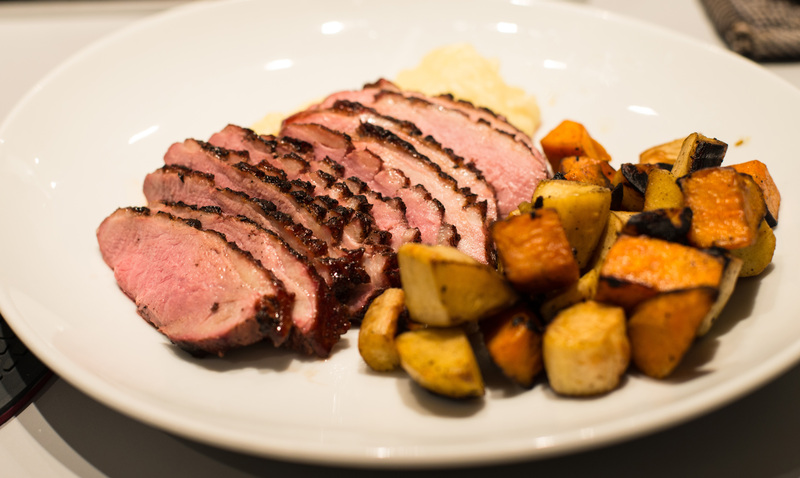 All the fat on a duck breast also makes it perfect for grilling – because fat takes up a lot of smoky flavors. 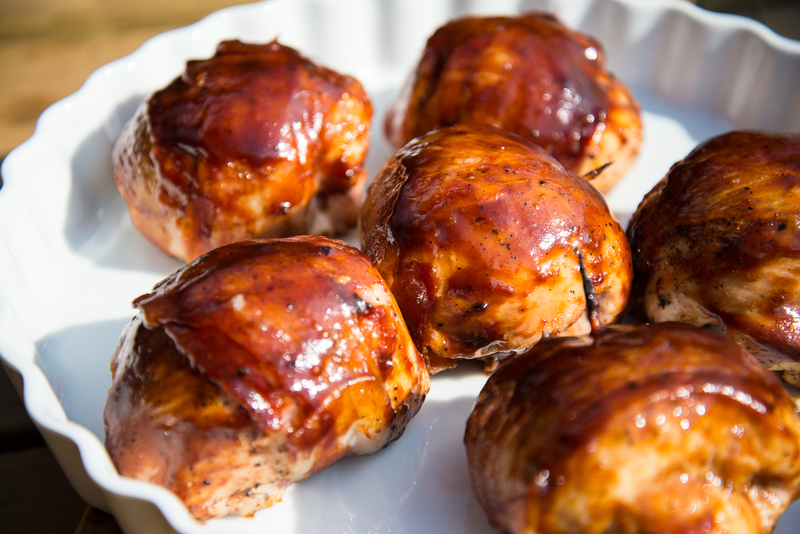 This is a nice and quick weeknight or weekend dinner, nothing fancy – but man it tastes good! This time I served it straight up like this, just the duck and the vegetables, but adding a little red onion compote probably won’t get you a lot of complaints either – it goes perfect with duck meat. If you want a sauce a simple balsamic reduction works really well too. 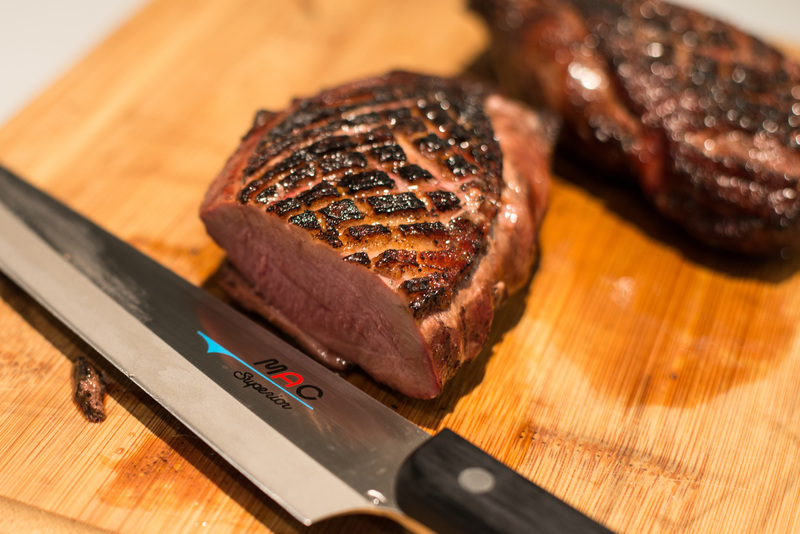 While the charcoal gets ready, score the fatty side of the duck breasts with a sharp knife. The goal is to increase the surface area of the fat to ensure crispy fat and ease rendering, so a fairly tight diamond/cube pattern is best. Make sure you don’t cut all the way through the fat and into the meat. 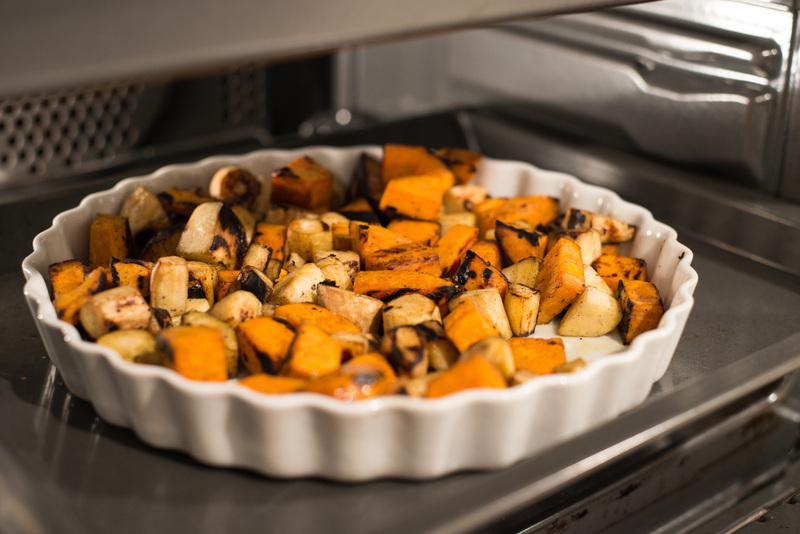 Peel and dice parsnips and sweet potatoes, and put them in a perforated grill pan (like this one for instance),on a griddle or even some foil. I highly recommend getting a perforated grill pan of sorts, it is a useful tool. Once the charcoal is ready, fill up one half of the grill with the charcoal, and leave the other half to be the “cold/indirect” zone. 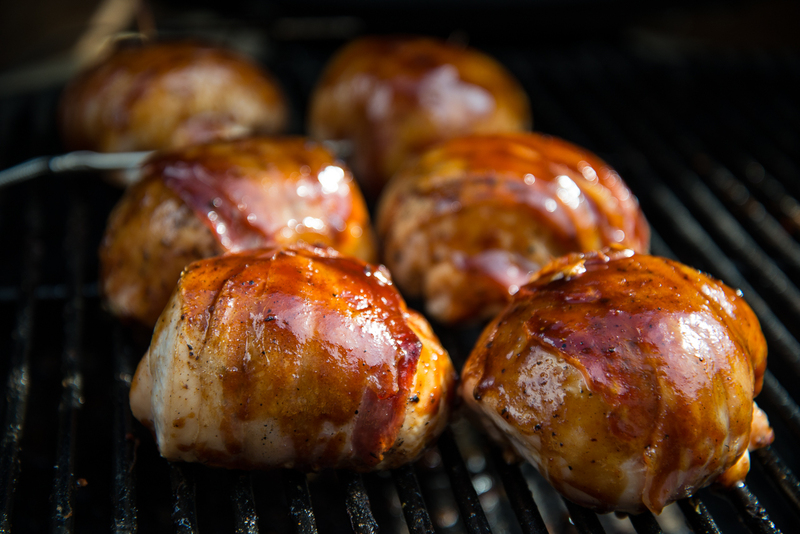 Throw some cherry wood chips on the coals at once, because you want smoke going for real when you put the cold duck breasts on for the first time. Here is a neat trick: Put the duck breasts on instantly when the coal is in place, on a cold grate. Starting the duck breasts carefully/slowly, renders a lot more of the fat off than going direct to high heat, and rendering is necessary for that crisp finish you want on the fat side. It also means fewer flame-ups later on. I usually leave them like this for 7-8 minutes, to let a bit of the fat melt off. If you put a drip pan underneath, you might even be able to catch some fat for use on the vegetables. 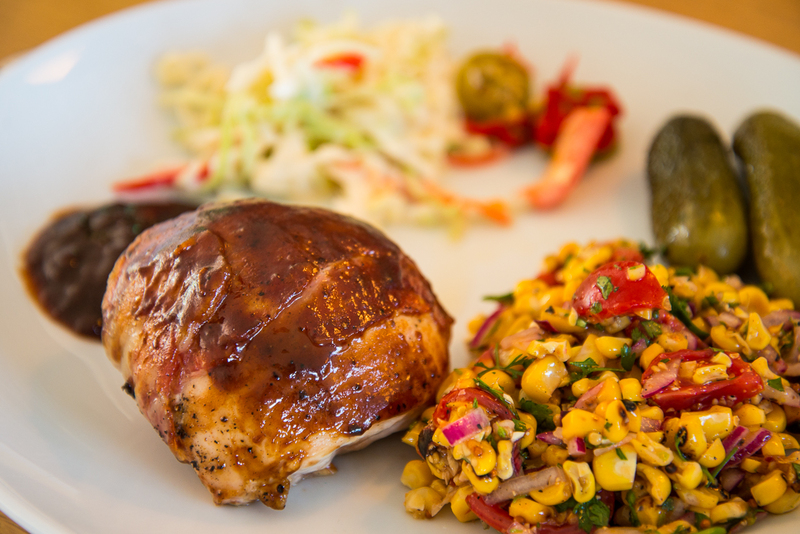 After rendering some fat off, put the duck on a plate off the grill while you grill vegetables, let it rest a while. Using the vegetable grill pan, fry up the vegetables directly over the coalswith duck fat and/or olive oil, turning over often with a spatula so nothing gets burnt. Gloves are nice to have.Once the vegetable are nicely browned, move them to the indirect side and cook with lid on for 20-30 minutes, turning them over every 5-6 minutes to get even cooking. When they’re done I usually stash them in the kitchen oven on low to keep warm while I focus on the meat. Now it’s time for the fun part, sear the duck breast properly on both sides over direct heat. Be aware, there will be flame-ups, especially when searing fat side down. Just move them around, burnt food is never tasty. Once seared check the internal temp using a Thermapen or other instant read thermometer. I like my duck at 55C (131F) which is sort of medium rare. If you want medium go to 60C (140F). If the duck isn’t finished after searing, put it on the cold side, lid on, and let it have another short round before checking again. Let the duck breasts rest for at least 7-@8 minutes before cutting them in thin slices and serving. Which smoke wood to use when? I get a lot of questions on which smoke wood to use for which foods. Here are some suggestions. Like anything else to do with BBQ, this is no exact science. And remember, what kind of rub or sauce you use and the spice level should also be part of the consideration. 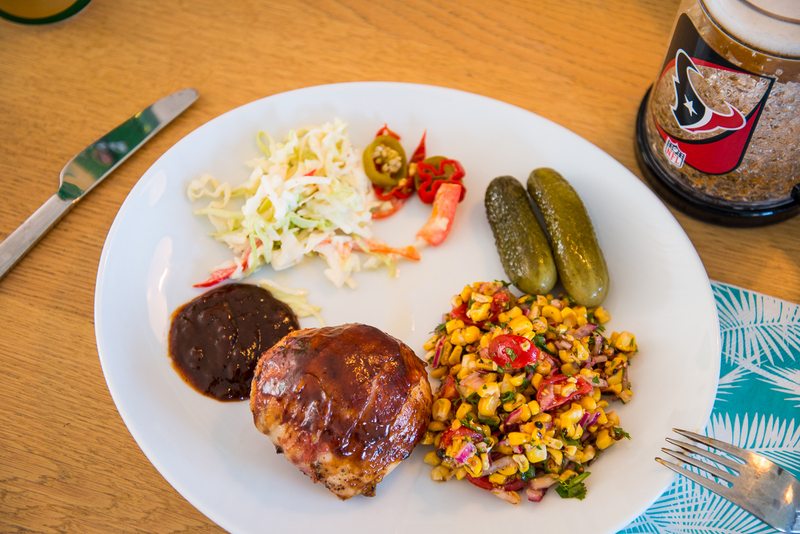 Pork – Pork works well with lots of different smoke woods. I like to use almost anything for pork. I use mesquite a lot for pork, and I use apple (real good for ribs), cherry and pecan wood. Sometimes when I really want smoke taste on pork butts, I use hickory as well. Want something light? Try Alder. Beef – Beef=hickory in my mind. Sometimes I’ll mix 50/50 hickory and mesquite. Oak is also good, the Jack Daniel’s oak wood chips are great for steaks for instance. Fish – Oak or alder is very popular for smoking fish. Here in Norway the juniper bush is sometimes used, but I find the taste too owerpowering. Vegetables – Since they’re not the stars of the show, my vegetables usually get smoked with whatever I’m using for the meat. Hickory and mesquite is great for baked potatoes and ears of corn (prick the potatoes with a fork first). Lastly, experiment. A lot. It’s the only way to learn what’s best for your tastes. There’s also other ways to make smoke, rosemary smoke from fresh rosemary for lamb for instance. Vines of various kinds can also be used. But don’t use fresh wood, it needs to be dried. Nothing green should go on the grill as smoke wood.